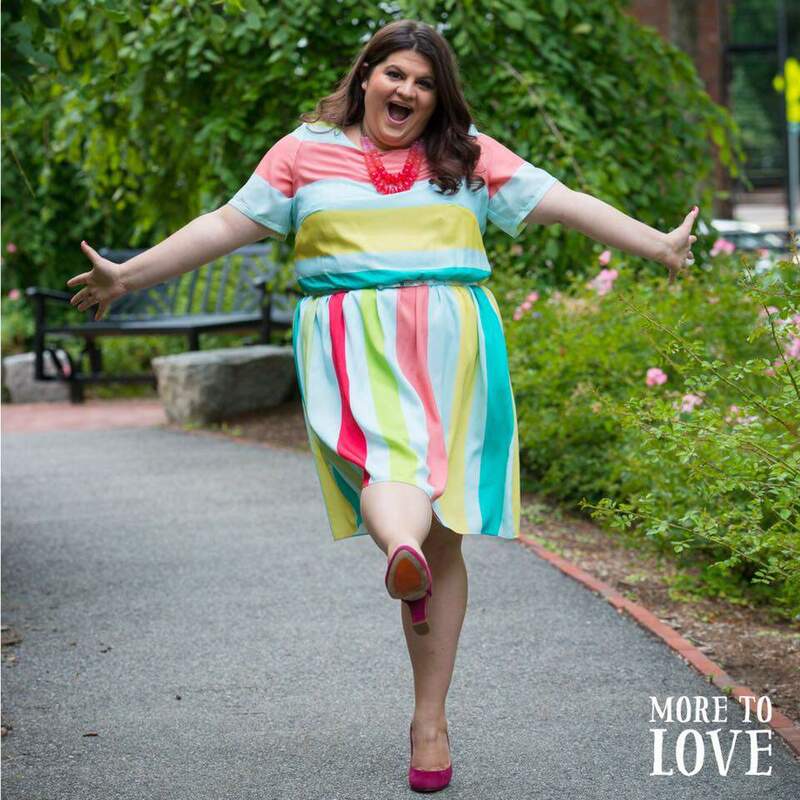 For today’s latest Curvy Boss spotlight, we interview Rachel Estapa of More to Love Yoga. More to Love Yoga was founded in Boston in 2015, to help others learn and apply body acceptance for themselves. Get to know this Curvy Boss! Here at The Curvy Fashionista, we’ve added the “Curvy Bosses” category to celebrate the work of plus size business owners and leaders. This week, Rachel Estapa, founder of More to Love Yoga, shares her business journey. If you didn’t know, More to Love Yoga was founded in Boston by Rachel in 2015, to help others learn and apply body acceptance for themselves. Comprised of in-person classes at the MTL yoga studio in Boston, online courses and in person events. “We blend lessons of body-acceptance and yoga so that you can learn how to make yoga poses work for your unique body,” explains Rachel. But enough of us setting things up, keep reading to learn more about this fly boss who is shaking up the yoga community! BH: Rachel! Thank you for taking to the time to share your story with TCF readers. Can you share when you had the idea for More to Love Yoga? This new attitude opened a whole world of possibility to me, and More to Love’s mission eventually emerged from it. I’ve spent years deeply committed to personal growth and professional training to help untangle the complex web of body-image so many of us experience. For nearly a decade, I’ve had a regular yoga practice which has supported my journey to body-acceptance, and knew that with the right combination of education and community, this approach to well-being could reach many more. But let’s face is: the typical “yoga body” doesn’t look like mine, so I felt called to change that perception. In 2015, I created More to Love Yoga as a way to help larger people feel connected and respected in their bodies, any size. Now, More to Love Yoga has a robust community of welcoming people committed to the personal and communal practice of yoga and body acceptance. BH: Why did you decide to incorporate yoga into More to Love? RE: More to Love is as much an approach to body-acceptance as it is a type of way to practice yoga. More to Love is built around a philosophy of how your body and your own intuitive nature play off one another, you just need to learn how to listen better. I’ve spent nearly a decade now developing this approach through lessons and teachings, so when it came time to add yoga, it was an enhancement of what I’ve seem work with thousands already. Yoga is a catalyst to developing faster body-acceptance, and that’s why More to Love Yoga resonates with those who have a history of strained body-image. BH: That’s fascinating! I so appreciate how you figured out what worked, and ran with it! Why did you choose to teach Kripalu yoga, over other yoga practices? RE: I’ve practiced many forms of yoga for a decade, but Kripalu’s stands out as the yoga which supports ALL of me – body, mind and spirit. Personally, I visited Kripalu when I was just starting to discover that it was possible to love my larger body, so the style of practice has been the backdrop for years. I trained at Kripalu explicitly to help teach big bodies and they were overjoyed – provided me with many additional opportunities to spread my message. 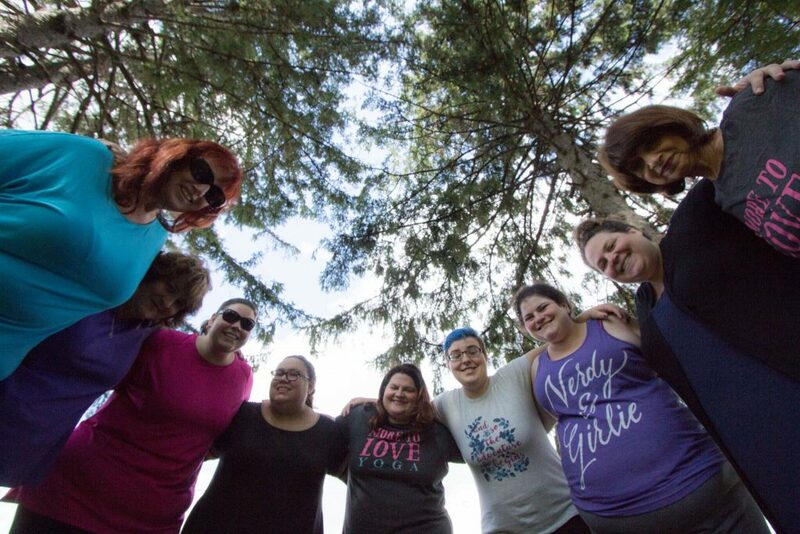 And this June, I’ll be hosting the first More to Love retreat at Kripalu, called A Lovely Rising, to welcome More to Lovelies to gather in a safe, empowering, and beautiful environment with me. BH: Wow! That’s so cool. But, how do you help your students get over/move through fear they may have when it comes to taking their first class? RE: This is my specialty: I love working with total newbies to yoga (and body acceptance.) I can feel their anxiety and worry and I acknowledge that with them – giving them permission to feel what’s going on and to know it’s OK to feel scared, unsure – it’s why More to Love exists! I try to talk to every single new person who joins, welcome them, and make them feel good about their choice. And it works, because after class, their whole vibe is electric and excited – all because I helped to make them feel OK to show up here, as they are, and let the yoga do its thing. BH: You recently received $25k for your business from the “MasterCard & Bank of America Grow Your Biz Contest.” What was that process like? RE: It was incredible! The whole process was only about a month (from when I applied the day before the deadline to getting awarded), but really, the whole moment was a positive affirmation of years of hard work I’ve put to building More to Love. And when I had to give my pitch (think of Shark Tank!) I opened with “I’m here because of my More to Lovelies – this opportunity is for me to tell you about them” and that really helped get me out of my own way and speak from the heart of More to Love. After winning, the press and media exposure was amazing – but in reality, because I worked so hard to get MTL in a good place, I was ready for all that came from the win. I feel like it was a good lesson of taking an opportunity when you’re ready for it. And let this sink in for a moment: the epitome of Corporate America awarded a fat-bodied yoga chick (I was wearing a bright floral blazer in a room full of traditional suits, btw) the grand prize, beating out 3 other well established and much larger businesses. That says A LOT about all the hard work our body-positive community has been doing…and I want to make sure I can pave the way for others in this space too. BH: Let’s talk nitty gritty. What business tools (software platforms, etc) are critical to MTL’s success? RE: My greatest organization tool is a simple, blank notebook – I currently have 5 that I work in, each one with a “theme” that I stick with and pull from. Because I’m a natural “brain-dump” type of person, I unload all my ideas on paper and then build out and organize them based upon the goals and projects coming up (usually 3-5 months at a time.) This is then where i use Google products and Trello to keep me on track. For emails, I use ConvertKit and other creative tools, like Canva and Planoly. I’m grateful that I am a 50/50 balance of someone who can generate big ideas and turn them into actionable steps, so I use that to my advantage whenever I can. BH: Oooo! I hadn’t heard of Panoly. Thanks for the rec! As a business owner, how do you deal with setbacks? One of the most common things as a business owner I deal with is my own personal energy level, so I take extra concern to make sure my wellbeing is balanced as much as possible. BH: Final question, and I’m sure you get it a lot. What advice do you have for other women looking to start a business? RE: If you’re looking to start, start before you think you’re ready to – but start small and by small, I mean telling even ONE new person a week about your idea counts. I think it’s very easy to think that a business has to be all flushed out and perfect before it’s unleashed into the world – but trust me, that will cause you stress. So start by speaking and talking to others, they’re questions and responses will help you immensely. How cool is this Curvy Boss? Well, if you want to learn more, attend her retreat, or just support her business, make sure you head on over to Rachel’s site, now! Learn more about Rachel and her business at MoretoLoveWithRachel.com! Make sure that you also follow Rachel’s Instagram, @rachelestapa! Talk to us, are you into or curious about yoga? Do you practice it? How does it make you feel? Let’s discuss! Looking for more Curvy, Badass, plus size business owners and leaders? See our other Curvy Boss features here! It’s Time For a Fat Camp Re-Do with Annette Richmond! 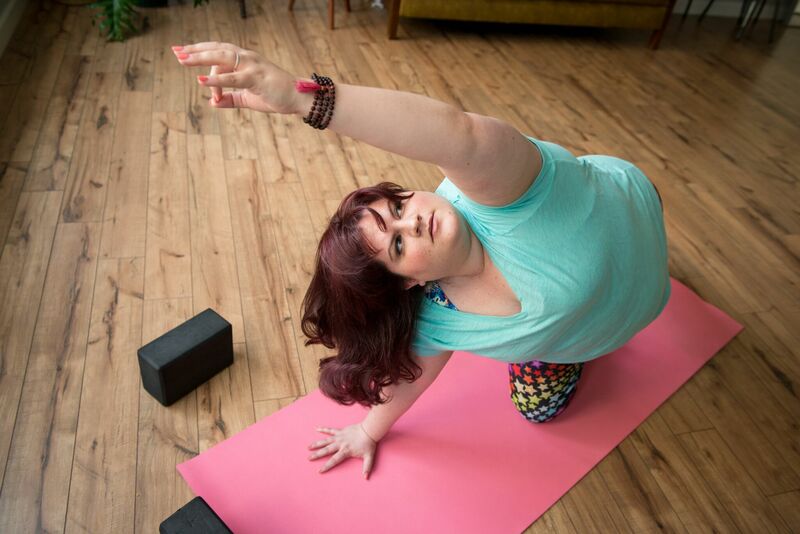 Plus Size Yogi, Jessamyn Stanley is Winning as She Partners With U By Kotex!